Rapid market changes and disruptive technologies are having an unsettling effect on the job market. They’ve resulted in a new paradigm that indicates the majority of us will not be part of a company’s staffing plans forever, whether we like it or not. In fact, the highest position of CEO, which was once considered immutable, is now the most vulnerable position in an organization as companies merge or are acquired by other companies. The generation of people beginning their careers today will change their jobs at least seven times before retiring, and four of these moves will be involuntary. Since no one is exempt from involuntary transitions, we should take steps now to prepare for this. Even when employed, we need to keep in mind that we aren’t paid just to go to work – we’re paid to add value, contribute to results, fulfill specific goals and objectives and satisfy the client’s needs. We need to see the organization as our client, and ourselves as providers of professional or qualified services. And this has nothing to do with our position within the company. We need to continually evaluate our own level of employability, whether we’re currently employed or in a period of career transition. Consider how you can improve on the following qualities that comprise employability. In tabulating achievements, many people make the mistake of describing what they did and the responsibilities they had, rather than what they’ve actually achieved – their contribution to the results. It’s important to have a clear and organized list of your achievements, accompanied by quantitative proof of the value that you’re adding to your job. This means that you need to conduct an ongoing follow-up of your achievements. A good way to review your achievements is by using a system known as PAR: Problem, Action, and Result, which involves identifying the problem or opportunity that existed at a given point in time, explaining the action that was taken, and noting the results generated from this action. Another way to measure your employability is to watch and study the job market, even when you’re not looking for a job. Stay up on any national and international industry news, as well as articles in trade magazines that involve your profession. This way, you can measure the extent to which the market values your position. 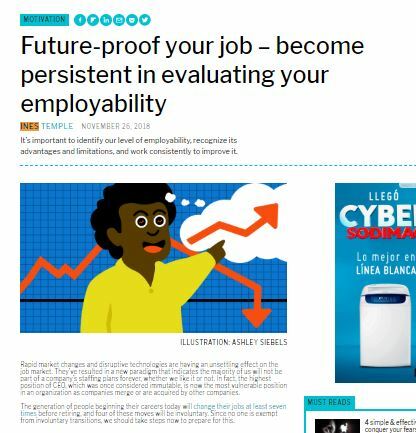 You will be more employable if you work on the skills valued by the market, which go beyond your knowledge and intelligence, the university you attended or the degree you hold. Update your skills by frequently attending courses or seminars, and in particular, keep up with everything related to the advances in technology that relate to your position. Ensure through networking that others know what you’re up to and whether you’re available. The majority of today’s jobs are found through one’s own networks. When a job opens up, companies first look informally within the organization or to friends or clients. Be proactive in terms of building your image and personal brand, including within social networks. Think in terms of personal marketing when fine-tuning your digital identity, and continually update your online profiles. Today more than ever before, people find their information about others through Google and LinkedIn. Remember: your personal brand and reputation follow you wherever you go, 24/7. Attributes that may seem less tangible can make the difference in who gets – and keeps – the job. This includes values, attitude, passion, creativity, curiosity, charisma, and adaptability. Communication skills also fall prominently into this category. Cultivate the capacity to effectively handle diverse social situations. While your soft skills aren’t quantifiable on a resume, your network can help relay them. Keep in mind that complacency and arrogance are employability’s worst enemies. To improve employability, we need to persistently sharpen our work skills and social intelligence skills, while ensuring that others know we’re there and available. Ines Temple is president of LHH DBM Peru and Chile, the leading career transition and talent-development organizations in both countries, and she has provided outplacement services and HR consulting to executives and other workers throughout the world. She has published over 800 articles and videos on topics such as the new world of work, personal branding, and employability. Her book, You, Incorporated: Your Career Is Your Business (Usted S.A.), has been a top bestseller among business books in Peru since 2012 and is now available in English. Learn more at www.inestemple.com. Interview with Bert Martinez., a successful serial entrepreneur; a sought after marketing and business strategist and one of the highest paid marketers in America! Interview with the Career Transition Expert, Ines Temple & Keynote Speaker Chris Westfall. Importantly, You, Incorporated shares how to approach our careers as though we’re the CEO, CFO, marketing director, head of sales and head of research in our corporation of one.